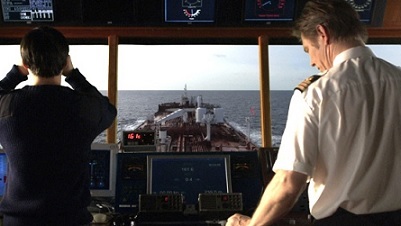 Bridge watchkeeping is the most important activity conducted at sea. Upon the watchkeeper’s diligence rests the safety and security of the ship, her entire crew, the cargo and the environment. It is a demanding activity, requires support, encouragement, motivation, self-discipline and a high standard of professionalism. Ships master must ensure that all watchkeepers understand the use of safety related equipment, prior to them keeping a watch. Bridge Procedures Guide (ICS) - This guide is an important part of the Company’s instructions and its contents must be understood by all bridge watchkeepers. It is important while navigating ship the officer of the watch understands practical procedures to avoid collision guided by masters standing orders. These procedures are only indicative, not exhaustive in nature and one must always be guided by practices of good seamanship. 2. The OOW shall read the Master’s instructions written in the Master’s Order Book carefully and affix his signature before taking over the navigational watch. 3. The OOW shall perform his bridge watch duties, and shall not leave the Bridge unless properly relieved by the Master or another qualified officer. 4. The OOW shall not transfer his duty if he is in doubt whether the relieving officer is physically and mentally capable of carrying out his duties effectively. Instead, he shall advise the Master. 5. The OOW shall call the Master immediately, if he is in any doubt regarding navigation, or if the vessel falls into any of the situations specified in the "List of Conditions to be reported to Master"
6. The relieving officer shall take over the watch after he has confirmed all items in the "Navigational Watch Transfer Checklist"
7. The OOW shall maintain a strict and constant look-out primarily by Sight, and use Binoculars, day and night. 8. The OOW shall observe the compass bearing of all approaching targets to determine if risk of collision exists. 9. If the OOW is to be relieved, but is engaged in a maneuver or in a VHF conversation or the like, the relief of the officer should be deferred until such action is completed. 10. The OOW shall pass other vessels, obstacles, fishing nets, and the like, keeping wide berth as far as practical. Required CPAs (Closest Point of Approach) are as follows. 11. The OOW shall be well aware of use of the Main Engine in an emergency so that he may use the Main Engine without hesitation as required. 12. The OOW shall use sound signals, such as Warning signals, Maneuvering signals, and Fog signals, without hesitation even at night. 15. In waters where danger to navigation exists in addition to the above items 13 and 14, the OOW shall post a Helmsman enough in advance, and change to Manual Steering when necessary. 16. The OOW shall always confirm proper steering by the Helmsman or Automatic pilot. 17. The OOW shall confirm the vessel position regularly. If the position is made by electronic navigation system, he shall verify the same by land fix, if available. If a scheduled time for plotting a fix or altering course has arrived, the OOW should first ensure that lookout or an evasive maneuver is not compromised. 18. The OOW shall compare the indication of the Gyro compass with that of Magnetic compasses on setting or alteration of course and after that, check once every hour at least. 19. The OOW shall measure Errors of the Gyro and Magnetic compasses at every watch, and log the same including the reason if unable to check error. 20. The OOW shall check the repeaters of the Gyro compass (including output to RADAR/ARPA, ECDIS, Course recorder, AIS, etc) to confirm if they are synchronized with the master compass. 22. The OOW shall regularly confirm RPM of the main engine and presence / absence of alarm generation, and if any abnormality is discovered, it shall be reported to the Engineer on Duty or the Chief Engineer. 23. The Echo sounder recorder should be switched on prior to each approach to shallow water, to port entry and prior to departure, and remain in operation while in shallow waters. As a guideline, the OOW shall use the Echo-sounder frequently to measure the depth when less than 50 mtrs and continuously where expected UKC is less than 5 mtrs. He shall compare the UKC with figures calculated from chart depths and advise any abnormality. 24. The OOW shall confirm Navigation Lights and other Regulation Lights, Shape signals, and Whistles are operating properly. 25. The OOW shall confirm carrying out onboard patrol . 26. In addition to the above, the OOW shall comply with the items that require attention for safety of navigation and prevention of environmental pollution. 27. For detailed guidance for Navigational duties, reference shall be made to the publications “Bridge Procedures Guide” and “Bridge Team Management”. 28. All instruments’ recording paper must be annotated before port arrival /departure and at noon daily, and confirmation done of correct synchronization. Navigational warnings and weather messages must be read and signed by the OOW, and brought to the notice of the Master. 29. During pilotage, the OOW shall continue monitoring the vessel’s position, keep lookout, in the same way as if no Pilot is on board and advise Master of any abnormality. 30. The OOW shall enter in the Bell book, the time of Handing over the “con” of vessel to Master and the time of taking over “con” from him.